Our Sunday reading began with the first step which God’s people took in restoring the walls of Jerusalem. This was no building project – although it was, of course, an immense one – but an exercise in healing an entire nation, wounded by the destruction of their capital city and banishment into exile. Reading’s ruined abbey (above) was built by Henry I "for the salvation of my soul, and the souls of King William, my father, and of King William, my brother, and Queen Maud, my wife, and all my ancestors and successors". Henry was clearly trying to restore his family’s relationship with God – just as the Israelites dedicated the Sheep Gate to God at the start of the rebuilding. How fitting then, that soon after the recent reopening of Reading’s restored abbey ruins, that Christians in Reading spent ten days of prayer in the ruins culminating this Wednesday when fifty Christian leaders gathered to worship and pray in expectation that 21st century Reading might shine the gospel of Christ as brightly as did Reading Abbey for many hundreds of years. One opportunity for us to do this, is this Sunday, when there is an infant baptism service with a large number of visitors attending. What we need is as many of the faithful as possible, filled with the Holy Spirit, praying for God’s presence to be powerfully evident in us. Please pray and come and pray! Join us as we celebrate with the other Southcote Churches, God's goodness in creation and his provision for all. If you can help by making a Shepherds's Pie, please let Gwyn Rudman or David Horne know. Thank you! Please come and join us in the hall for coffee, tea and cake. All Welcome, so bring the children too! If you can bake a cake for this fundraising event, just bring it on the day. We always appreciate your wonderful contributions. We look forward to seeing you there! Join us on October 10th as we meet at St Matthew's at various points during the day, to pray for the mission and ministry of St Matthew's and all the churches in Reading. On Saturday 13 October we will be hosting a course on Effective Listening Skills, run by the Acorn Christian Healing Trust. Pads did the course this summer at the Acorn's headquarters and found it so helpful that he'd like to invite you to join him for Module 1 of this skills course. Cost is normally £50, but we are offering it free to church members. 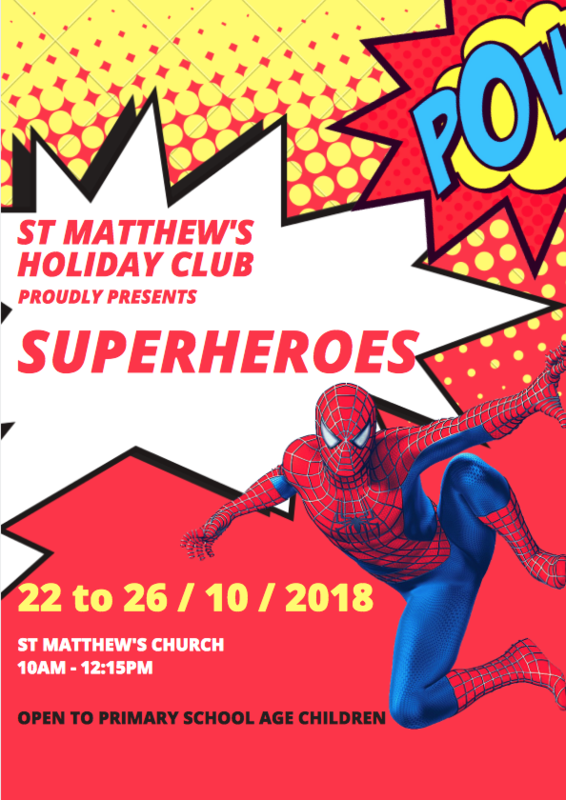 We're looking forward to this new edition of the Holiday Club and with the SUPERHEROES theme a buzz of excitement is already building up. Please have a look at your diary and see if you could give a morning (or two?) of your time that week, to help us run the club. We need helpers - no experience needed. Just to "be of good cheer"... and enjoy being around children. You'll love being part of the team! There's a free lunch afterwards, and you'll get back home brimming with energy. Speak to anyone who has done it before, or to Pads and the team.